Give the ball to Zack Moss, or let Tyler Huntley keep it? Utes' dilemma is all about reading comprehension. Quarterback is ‘going to be part of our run game,’ Kyle Whittingham says. So why wouldn't Utah's coaching staff just tell quarterback Tyler Huntley to turn and hand the football to his Florida high school teammate? The answer is rooted in football mathematics and physics. These days, you can't block every defensive player. That's why the zone read is a staple of nearly every offensive scheme, including Utah's. 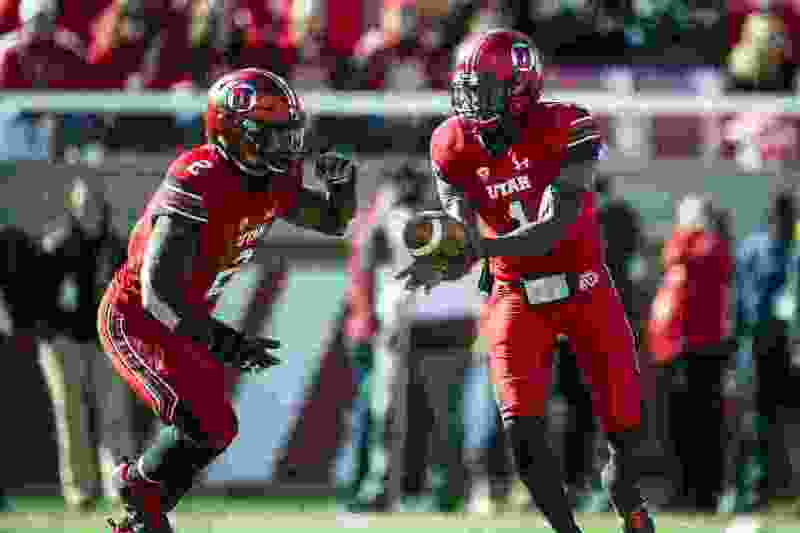 If observers wonder why the Utes ever would have Huntley carry the ball instead of Moss, Armand Shyne or another back, coaches say involving Huntley as a runner is necessary to succeed against an aggressive defense, with tacklers outnumbering blockers. So the Utes' dilemma is how to make Moss as productive as possible and keep Huntley healthy, while trying to move the ball against defenses designed to stop the run. The coaching strategy involves ensuring that Huntley makes the proper read in handing the ball to Moss or pulling it back and running himself, as some people believe he did too much last season. It's also true that Moss' career-high, 196-yard rushing night came in November vs. Colorado, when Huntley was sidelined due to injury in one of three starts he missed as a sophomore. Moss' 26 carries against the Buffaloes more than doubled the number of runs by backup quarterback Troy Williams. Zone read • The opposing defensive end is left unblocked. If he moves inside, the quarterback should keep the ball and run outside. If the end stays in position, the the quarterback should hand the ball to the running back. Either way, the end theoretically is taken out of the play. Run-pass option (RPO) • The offense identifies a defender, usually a linebacker, with responsibilities for running and passing plays. If the defender moves toward the line of scrimmage, the quarterback should keep the ball and throw beyond him. If he stays in position, the quarterback should hand off the ball to the running back. And there’s no sense giving the ball to Moss just to meet quotas, if the defense is stacked to stop him and the unblocked end is always charging toward him. “The real key behind the zone read is equating the numbers, and forcing the defense to have one more threat to worry about,” Whittingham said. College football lore suggests the zone read was invented accidentally, when former Arizona coach Rich Rodriguez was coaching at tiny Glenville State in West Virginia in the early 1990s. A quarterback missed a handoff, so he ran around the spot vacated by the crashing defensive end. Pete Hoener, now an NFL assistant coach, is credited with developing the system at Iowa State in the late '90s as a way to deal with superior athletes at other schools in the Big 12. And now, just about everybody's doing it, because defenses are so committed to loading up inside against the run, while trusting their cornerbacks in man-to-man coverage. The latest evolution is the run-pass option (RPO). The quarterback reads a linebacker's movement and chooses to hand off the ball or pass it over the defender's head, if he's coming toward the line of scrimmage. (Rick Egan | The Salt Lake Tribune) Tyler Huntley (1) hands off to Zack Moss (2) during the Ute practice, Friday, Aug. 3, 2018.